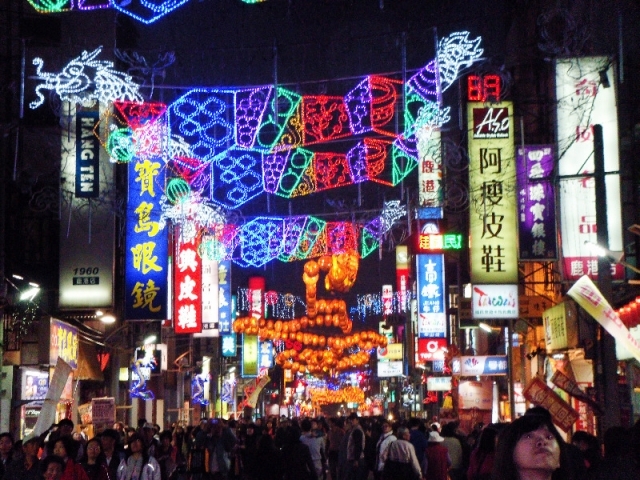 Night markets in Taiwan are street markets in Taiwan that operate in urban or suburban areas. They are similar to those in areas inhabited by ethnic Han, such as Southeast Asia. A few, such as Huaxi Street Tourist Night Market, (or Snake Alley) utilize purpose-built marketplaces but most occupy either sidewalks (pavements) adjacent to streets or entire streets that are normal thoroughfares by day. Some night markets in smaller side streets or lanes feature retractable roofs. Most of the markets operate daily and feature a mixture of individual stalls hawking clothing, consumer goods, xiaochi (similar to snacks or fast food), and specialty drinks. The atmosphere is usually crowded and noisy with hawkers shouting and fast-paced music playing over loudspeakers. Taiwan Night Markets changed from small local gatherings to noisy streets lined up with vendors. These vendors have to adhere to some laws set by the Taiwanese Government. There are vendors selling food in some of the most famous Night Markets all around Taiwan. There are many night markets in Taiwan. Though some of the xiaochi foods available will change from year to year with passing fads, certain xiaochi foods such as oyster omelets, chicken shawarma, and stinky tofu persist and have become staples in many night markets. Sometimes, the night markets of a city, or even just one particular market within that city, become well known for a certain type of food that is unique to the area, or prepared particularly well there. For example, Tainan has become known for its ta-a noodles and "coffin cakes(棺材板)", bread baked into the shape of a stuffed, hollowed out coffin. In Taipei, the Shilin Night Market features a particular store, which is well known for serving tasty fried chicken breast in large portions and for a low price. There is also the iron eggs from Tamsui.